A 23-year-old Illinois man remains in a county jail after police say they uncovered pornographic pictures and videos of young children on his computer. 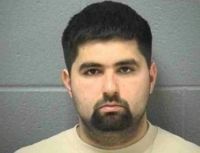 Edgar A. Lupian, of Joliet, was arrested after detectives served a search warrant and took with them his computer, other devices and a passport. The investigation lasted two months, according to a report found online.